California Department of Water Resources Chief Snow Surveyor Frank Gehrke along with United States Geological Surveyor Frank Anderson walk out for the first media snow survey for the 2015/2016 season. The California Department of Water Resources' Chief Snow Surveyor Frank Gehrke at the first media snow survey for the 2015/2016 season. A group of news media follow the Department of Water Resources along with the United States Geological Survey for the first media snow survey for the 2015/2016 season. 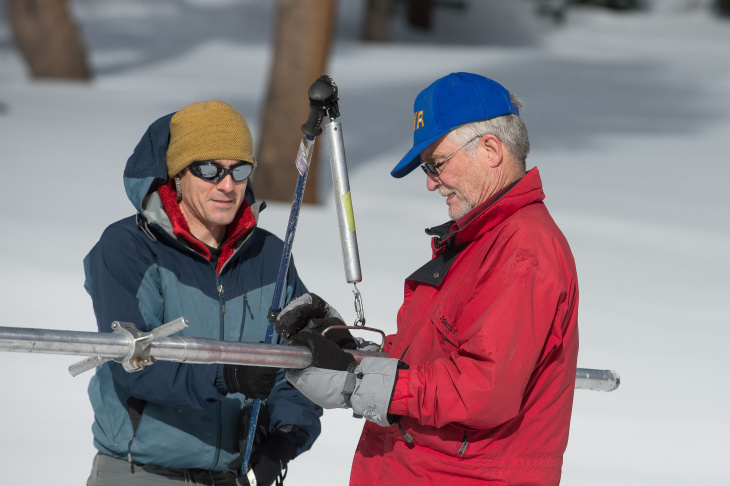 California Department of Water Resources Chief Snow Surveyor Frank Gehrke along with John King, left, with DWR Snow Survey, at the first media snow survey for the 2015/2016 season. 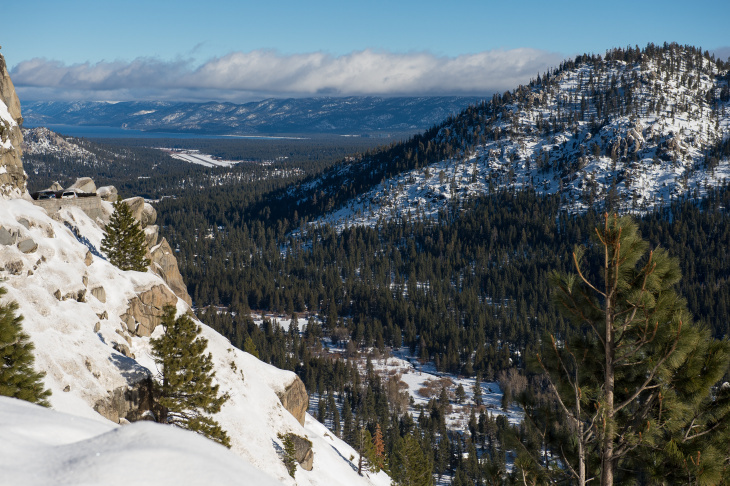 A look at Lake Tahoe, Calif. from Highway 50 on the morning of the first snow survey for the 2015/2016 season. 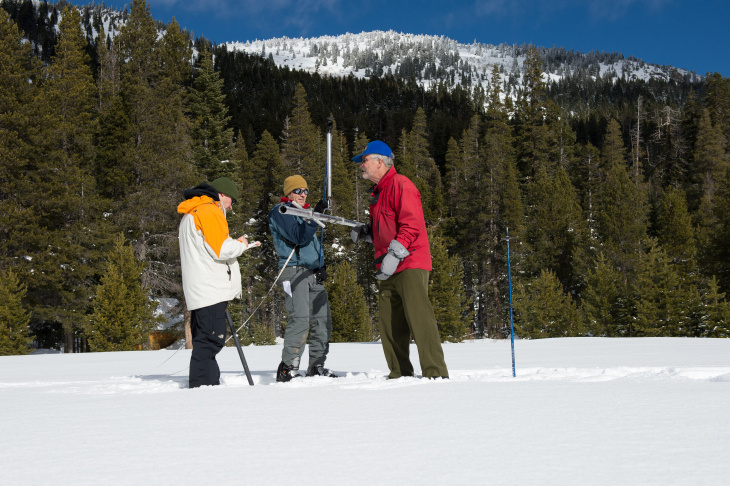 California Department of Water Resources Chief Snow Surveyor Frank Gehrke, along with John King, center, with DWR Snow Survey and Frank Anderson with the United States Geological Survey, left, at the first media snow survey for the 2015/2016 season. 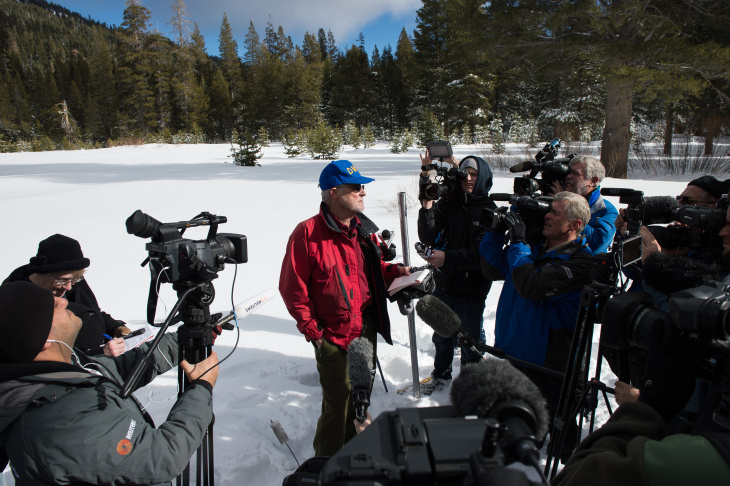 The California Department of Water Resources' Chief Snow Surveyor Frank Gehrke answers questions for the media at the first media snow survey for the 2015/2016 season. Officials in drought-stricken California say the water content of the Sierra Nevada snowpack has measured 136 percent of normal for this time of year, the Associated Press reported. Frank Gehrke of the Department of Water Resource said Wednesday he is encouraged by the manual measurement taken Wednesday in the Central Sierra, which includes Lake Tahoe, according to AP. However, he says the parched state has a long way to go before the drought is over. Gehrke says the measurement marks an improvement over the previous survey taken in April, when no snow was found at the site. 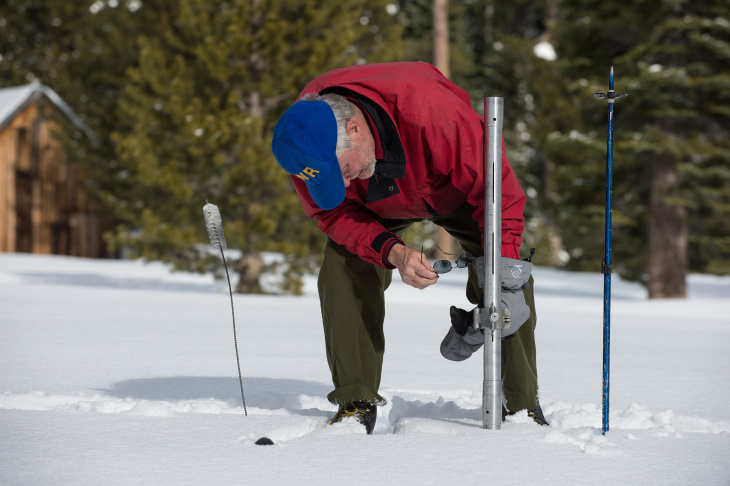 Gehrke's survey followed an electronic measurement last week that put the water content of the snowpack at 112 percent of normal. Even more snow has fallen since then. State water managers have said it's too early to declare an end to four years of punishing drought. They say they'll feel more confident if the April 1 snowpack is 150 percent of normal and depleted reservoirs reach normal levels. "After four and a quarter years of drought, we have such a high mountain to climb that we're still rather concerned that we might not be able to get there even if it did rain quite a bit this winter," Doug Carlson with the California Department of Water Resources told KPCC. 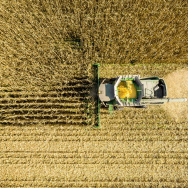 He added that precipitation blowing in warm weather — 2015 has been the hottest year in the state since record keeping began in the 1880s — will likely fall as rain rather than snow. 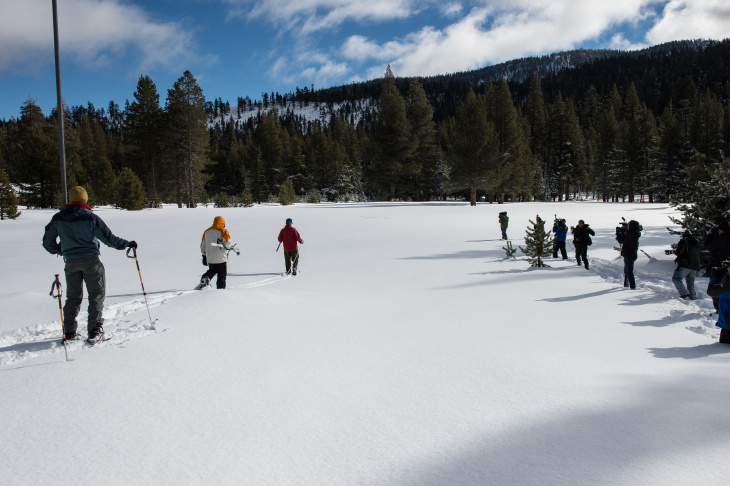 The snowpack provides about 30 percent of California's water supply during the months when it melts and rushes through rivers and streams to fill reservoirs that remain critically low. Carlson said that Shasta Lake, the largest reservoir in the state, is only at 31 percent of its total capacity and a little more than half of its historic average for Dec. 30. 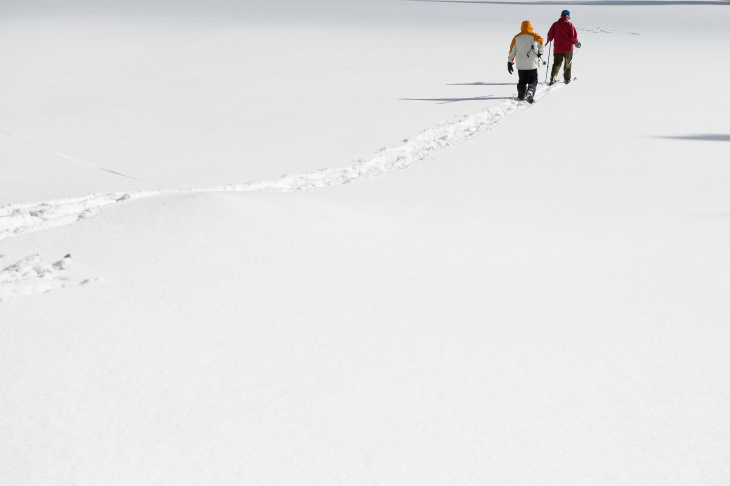 Last Jan. 1, the snowpack was a meager 45 percent of the historical average. 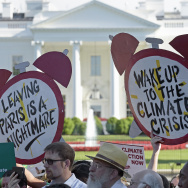 On April 1, it hit a record low of 5 percent.